Under Governor Thiru Banwarilal Purohit, Parliment has assembled. In the Parliment, Governor has announced the Tamil Nadu's this year plan details. Governor Thiru Banwarilal Purohit has announced a most important and useful plan for Tamil Nadu People. He announced that "Two Wheeler for Women" Provided under minimal Cost. The Minimal Cost of Two-Wheeler is about Rs.20,000 to Rs.25,000. On 2017, February, Edapadi Palanisamy has elected as Chief Minister. After reported as a Chief Minister, Mr.T.Palnisamy has signed this Two-Wheeler Plan for Tamil Nadu. Our Government has allocated 500 Crores for this Two-Wheeler Plan for Women in Tamil Nadu. Our Honourable Late Chief Minister Jayalalitha's birthday is on 24th February. Our Honourable Late Chief Minister Ms. Selvi Jayalalitha's birthday is on 24th February. Our Government is going to implement this Two-Wheeler Plan for women in Tamil Nadu on Our Honourable Late Chief Minister Ms. Selvi Jayalalitha's Birthday. Nowadays, Every woman is working in various Places. Our Government has announced this Two-wheeler Plan in order to reduce the complication.This Process is purely based on the women's development, The Two-wheeler which has been purchased using this scheme cannot be sold for the period of five years. 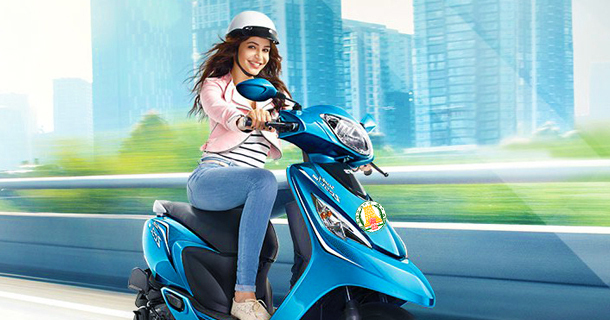 Government Employees, Private Sector Employees, Government Sector Employees, Entrepreneur, Village Employees can apply for the Two-Wheeler Scheme. The application for the Two-Wheeler Plan will be available in all Corporation Office, Regional Development Office, Panorama Office. Candidates can apply for the Two-Wheelers and get it. The Candidates should apply for the Two-Wheeler between 22.01.2018 to 05.02.2018.